Used Peugeot 208 Review - 2012-present | What Car? What's the used Peugeot 208 hatchback like? Producing a small car has been a struggle for Peugeot in recent decades. Every one of its efforts has inevitably been compared with the 205, a high water mark the company hit in the early 1980s and which it seemed doomed to be unable to match. 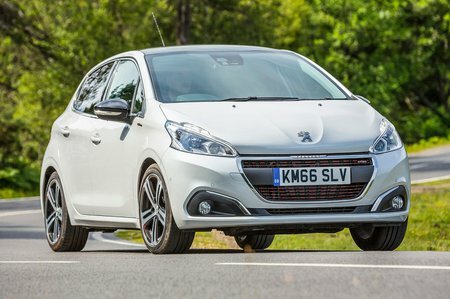 But with the launch of the 208 in 2012 Peugeot seemed to recover a bit of its lost mojo. For starters, there’s the styling. The 208’s cute detailing, tidy curves and beaming face give it instant kerb appeal, arguably more so than rivals such as the Ford Fiesta and Volkswagen Polo. The effect continues inside, thanks to a clean-looking dashboard smattered with upmarket materials. But the 208 is more than just a pretty face. Punchy engines make it responsive to drive, and those same engines deliver decent fuel economy, too. From its launch, five petrol engines, ranging from 1.0-litre to 1.6, and five diesel engines, from 1.4 to 1.6-litres, were available. Power outputs varied from 68bhp right up to 205bhp in the sporting variant. Trim levels are equally as far-ranging. There are four core trims plus three GTi versions and a further three special edition models. The entry-level Access trim equips the 208 with heated door mirrors, cruise control, air conditioning, Bluetooth and remote central locking as standard, while upgrading to Active adds 15in alloy wheels, LED day-running-lights and a 7.0in touchscreen infotainment system with DAB radio and smartphone integration included. The mid-range Allure models get a bit more chrome, 16in alloys, rear parking sensors and automatic lights and wipers thrown in, while the range-topping GT Line gains 17in alloys, dual-zone climate control, folding door mirrors and red stitching inside. Want a bit more power from your 208, then Peugeot has three variants of the GTi, all using the same 205bhp, turbocharged 1.6-litre petrol engine. 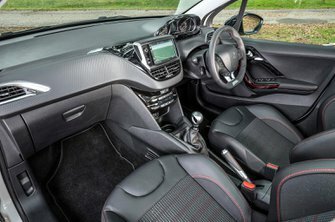 The standard 208 GTi is adorned with 17in alloys, a rear spoiler, chrome twin exhaust system and leather-clad sports seats, while opting for the GTi Prestige adds sat-nav, heated front seats and a panoramic sunroof. The final variant sees the Peugeot Sport division tweaking the 208, with it rolling on 18in wheels, with a wider front track, lower suspension, a Torsen differential, specific springs, dampers and wheel alignment set-up compared to the standard GTi, while inside there are Alcantara-covered sports seats. However, if you are pining for something a little bit more exclusive, Peugeot has three limited edition trims to choose from. The Active Design model is based on the standard Active-trimmed 208 and adds front foglights, 16in alloy wheels and numerous exterior detail tweaks, while the Allure Premium is only available on five door models and adds sat-nav, a reversing camera and a panoramic sunroof to the package. The most exclusive model, is one that has a long-standing association with Peugeot - Roland Garros. This trim is only available on five-door models and comes with 16in alloy wheels, tinted rear windows, rear parking sensors, all round electric windows, cruise control and numerous orange details on the outside. Inside the orange theme continues but is joined by a panoramic sunroof and Peugeot's fully-loaded 7.0in touchscreen infotainment set-up. On the road, however, the 208 isn’t perfect. It isn’t the most pleasant car in the world to drive; the engines are all rather noisy and feed a lot of vibration back into the car. And while the steering is light, it’s extremely remote, which means it often comes as a vague surprise to find that turning the small wheel has an effect on the front end of the car. Performance fans might be interested in the GTi model, which is fast and comfortable but not as involving as some of its rivals. That said, the awkwardly named GTi by Peugeot Sport model is rather more entertaining and definitely worth a look. That wheel is small because of Peugeot’s quirky interior design, which places the gauges above the wheel so that you look over its top, rather than through it, to see your speed. The problem is, this means shorter drivers will find the lower half of the gauges obliterated, while the dials themselves are tiddly and not that easy to read. With that exception, front seat occupants will be pretty happy with their lot. The dashboard looks and feels smart and the bits you touch feel like they’re built from high-quality plastics. There are some more suspect materials further down the dashboard, but on the whole it’s a classy effort, and the front seats themselves are comfortable, offering plenty of space and lots of support. Farther back, the picture isn’t so rosy. Both rear seat and boot space are merely average for the class, with several other used cars giving you more room to play with. The 208 received a mild facelift in 2015 that brought tweaks to the styling to bring it up to date, a few changes to the specification and several notable updates to the engine range to reduce emissions.